Friday, July 15th: Northgate Community Centers’ 10th Anniversary Party. 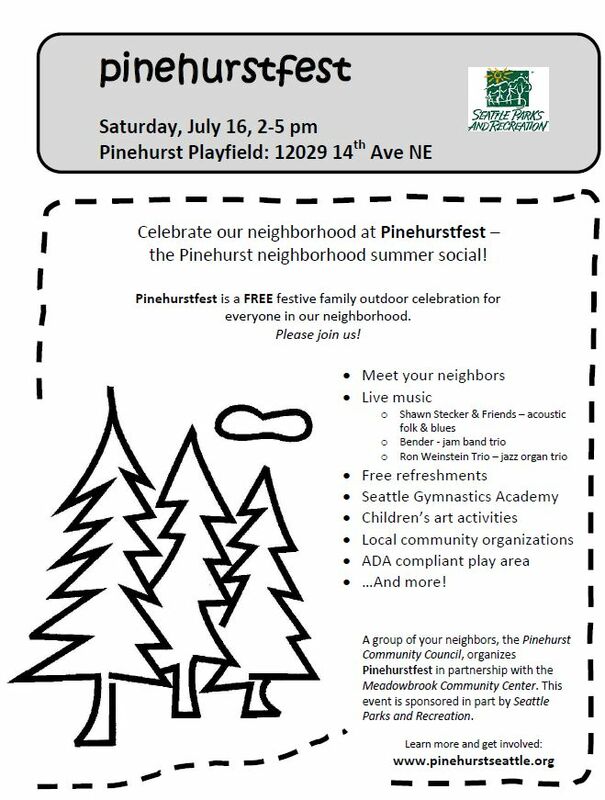 “Free hot dogs, juice, wood building projects for children, music-Route 66, games for kids.” 6-8 PM, 10510 5th Avenue NE. Wednesday, July 20th: Share A Story, Craft a Lantern. The Seattle Public Library invites families to create lanterns and share stories about people who live and have lived in the Lake City area from 3 p.m. to 5 p.m. Wednesday, July 20 at the Lake City Branch, 12501 28th Ave. N.E., 206-684-7518. Tuesday, August 2nd: Neighborhood Night Out. We’re not throwing a big party this year (that’s on the 19th of this month–see above) but you should get together with the neighbors on your block to work out emergency procedures and get to know each other. And don’t forget the Lake City Farmers Market is every Thursday through September. The Library usually sponsors some sort of interesting activity to accompany it.